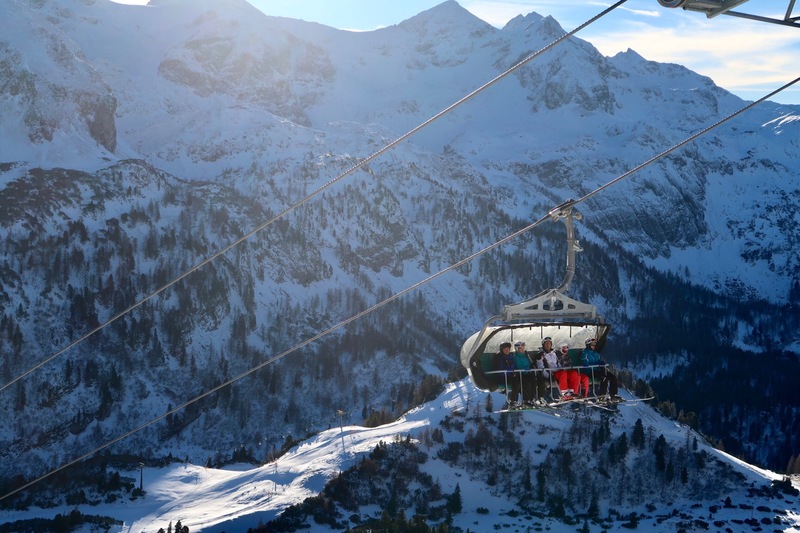 Over the past few years since we learned skiing and also before that time, with snowboards on our feet, we’ve visited plenty of ski resorts and skiing areas all over the Alps, including prime winter destinations in Germany, Austria and Switzerland. The Pongau region in Austria we mostly know for its famous Königsjodler Via Ferrata in the Hochkönig mountain range and we also have hiked around Flachau (and loved it! ), but we’ve actually never skied here before. So when we got invited from Obertauern to visit and ski one weekend in their area, we were curious to find out more! Since we started skiing only two years ago and are unfortunately not liing with a chairlift on our doorstep, we’re always looking for a great variety in difficulty of slopes in a ski resort. Nice wide and easy ones to start with and get back into it again, but also more challenging and fun ones to get better. Obertauern has it all: Over 100 kilometres of slopes, mainly medium (red) in difficulty, but also enough easy (blue) and a few steeper (black) ones are located on both sides of the village and valley expanding from Seekareck and Seekarspitze to Gamsleitenspitze where the famous extreme slope “Gamsleiten II” is located. Depending on the time of the day there is a sunny or shady piste the whole day. Pefect slopes in Obertauern – beginners and professionals! …and this REALLY is a great thing! Once you’ve reached your hotel or accomodation there is no need to get back into your car again until you leave Obertauern. Basically all the hotels are located along the main road or any slope and all slopes and valley lift stations are connected by lopping roads. You don’t even have to get into a bus, but can put your skis on right in front of the hotel and ski straight back to bed. We like! So easy to get around: No car, bus or taxi needed, from hoel door directly on the slopes! Obertauern is better known as the “”Austrian Snow Bowl”: The average snow depth here is over 2,5 meters (!) with snow often lasting from October until May. It is the leading Austrian winter sports destinations with the highest snow safety the whole skiing season. That’s a big plus for any visitor, especially for those that come a long way to ski and enjoy the snow and booked in advance. Here the chance of disappointment is kept to a minimum! When staying in Obertauern we did not only have really great food at any place we ate, but also found many vegeterian and healthy options next to the “classic” Austrian dishes. Kaspressknödel @ Treff2000: BIG LOVE! Since we only spent a weekend in Obertauern where we mainly skied and ate (:-)), we only scratched the surface of the countless possibilities here: From cross-country skiing to snowbiking, horse drawn carriage rides, snowhoeing and winter walks there is a wide variety of activities for everybody. In friendly cooperation with Tourism Obertauern. More information: www.obertauern.com – thank you!